Here are some links to random fibery things I found of interest. (If you follow me on Pinterest, you’ll have seen these already.) It’s probably also a good place to ask me any questions you might have. Stitch pattern calculator (that is, given gauge and a particular width, this will calculate how many repeats can be used). How many stitches will fit on a given circular needle (chart includes different lengths of needles and different thicknesses of yarn). Planned pooling with handpainted yarn meant for knitting. Cavandoli knots, to be used instead of hemstitching. I’ve collected all the patterns listed for the technique on Ravelry in this bundle, because there’s not enough patterns there yet to make it worth requesting a new attribute. Unholy heel: another way of doing a short-row heel without wrap-and-turn. Homemade knitting thimble, for those who like to do their stranded knitting with both yarns held in the left hand. Chinese Waitress cast-on with crochet hook. Clever things you can do with purled i-cords. Hatch Stitch Edge makes a fancy, tidy selvedge. Long tail cross over cast-on. 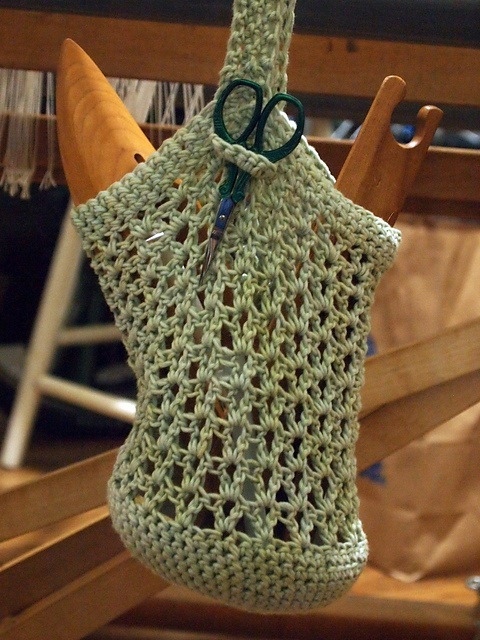 Twisted decreases for use with traveling stitches. Working with a stationary warping paddle. 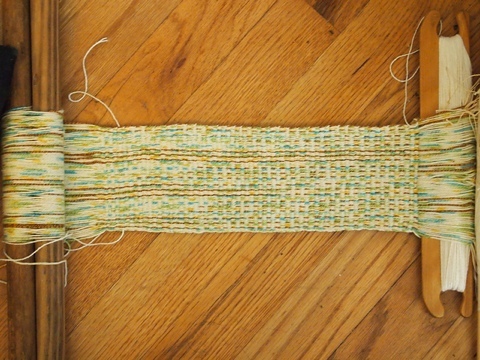 Warping a loom directly from a warping board. 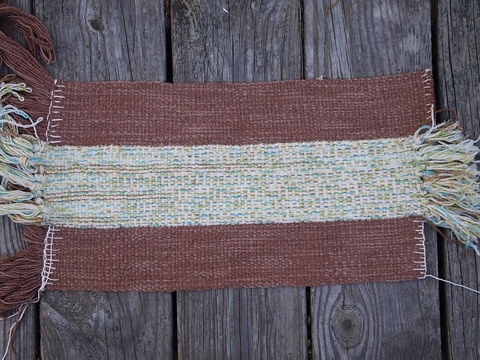 Patterned bands with a two-hole rigid heddle. 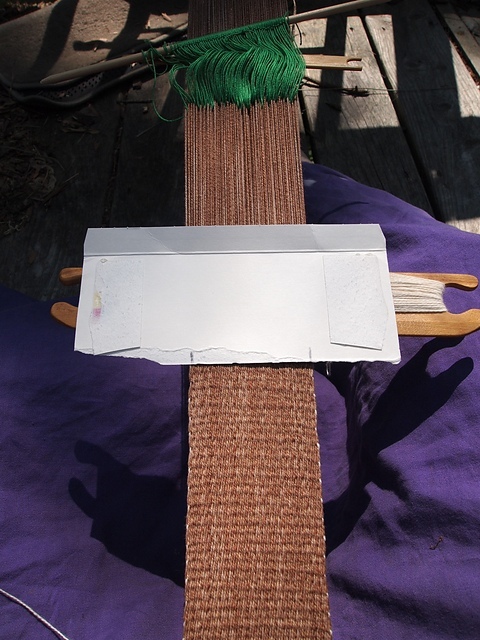 Using a homemade nail loom. Deflected warp on four shafts. Darning with conspicuous and attractive patterns. Plaid! a method for making a tidy loop at the top of a friendship bracelet. Making and reading patterns for friendship bracelets. Dealing with ease in sewing patterns. Making patterns from finished clothes. Hey look, I made something! Well, several somethings, only I haven’t posted about them either. Oops. Anyway, here, look, I made a bag to hang from my loom and keep tools in! Here’s my new-to-me loom in an earlier stage of being fixed up. I’ve done some work on her since I took that picture: wiping everything down with diluted Murphy’s oil soap, rubbing in some Wood Beams, getting the rust off with wire brush and naval jelly, moving the treadles around to the back where they started out, and replacing the rusty and pitted lower warp beam. I have a little rod stock on order to replace a rod in one of the harnesses. Finding metric rod stock in small quantities in the US is hard to do. I wish I could say I was surprised. After that, the only thing I need is tie up cord. I’m waiting until I can afford the fancy TexSolv tie up cord, because I gather it’s worth its cost. And then I can start warping the loom (putting the warp threads on) and get to weaving. She’s a Lillstina 46″ floor loom (means I can theoretically weave 46″ wide fabric on her)—a counterbalance—and her name is Diamond Lil. 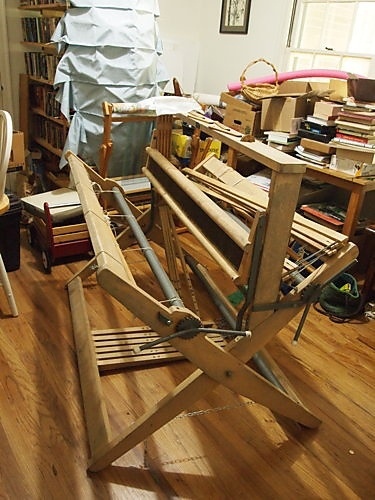 Other bits I already have that I’m going to need: a tall chair that I hope is the right height, a warping board, shuttles and bobbins, and lease sticks. 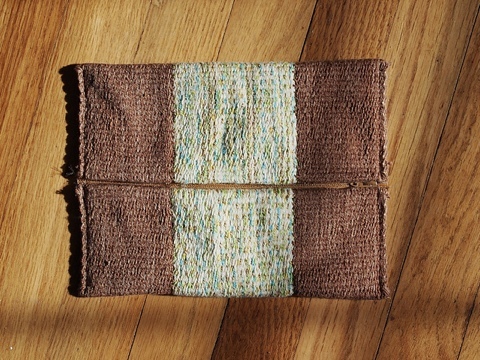 Then I washed the strips and sewed them together by hand to make one bigger strip. It’s nice to finish something. This was an exercise in making lemonade from lemons! I had some grey Coopworth combed top, which I handpainted. 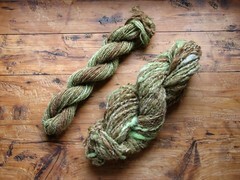 Unfortunately, I was (and am) still pretty new to dyeing, and the fiber got somewhat felted. So I pulled it apart into color chunks, and combed the different sections to produce a very little bit of combed top which was lovely to spin up into a small quantity of semi-worsted 3-ply using a spindle. Because the fiber had been felted, there was a lot of combing waste. I needed something to practice wheel spinning with (because I had some fiber I wanted to spin on a wheel for the Tour de Fleece), so I drum carded the waste, knowing full well that I’d end up with lumpy-bumpy thick and thin yarn. Which I did, and then I plied it with some very thin bouclé that my friend had. I liked it, but it was bulkier than I usually like to use, and besides, it wasn’t really quite my style. So I decided that the two yarns put together would make a project, and bethought myself of using a backstrap loom for the purpose. Now, I’ve put together another backstrap, but haven’t finished the project. 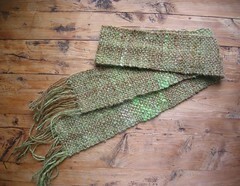 Also, it’s been over 20 years since I did any serious weaving. I am therefore pretty damn pleased with the result! It’s a fairly consistent width and the selvedges are not tooblobby. I borrowed a camera from a friend, and so here are some pictures of Persephone! So I was driving up the street this morning when I noticed a jumble of wood boards and stuff on someone’s curb (where people leave stuff when they are willing to let people just take it away). I drove half a block further when the nature of some of it sunk in and I screeched to a halt. Two minutes later I had a trunk full of two warping boards (one of which doubles as an inkle loom) and was inspecting a rather dilapidated old floor loom. Five minutes later I was walking downhill holding T’s hand while the guy who had put his mother’s old loom out carried the loom down to my house. I have to inspect it more closely and it clearly needs a lot of loving care – a good wipe down, oil, new belts, new cord to hold some of the bits on, and who knows what all. I hope it can be put back in working order and that I can find somewhere to put it in my house. 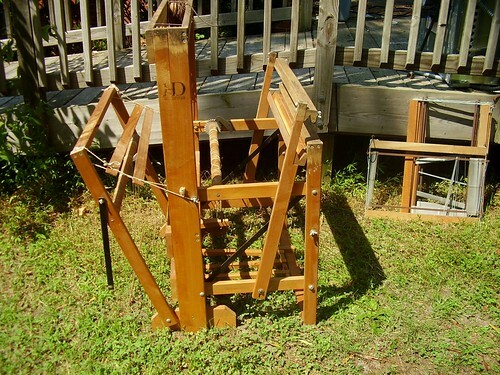 It’s a 22” four-harness, four-treadle floor loom from Harrisville Designs. I think it was stored upside down on a wood floor. I think many of the metal bits (the reed and some of the rods) are going to need replacing due to rust. Some of the heddles are rusty too. It needs new belts (or whatever they are) so the harnesses will go up and down. The manual and the parts catalog are going to be My Friends, and fortunately, they arrived in the mail yesterday. It’s going to be a slow process getting her back in order.